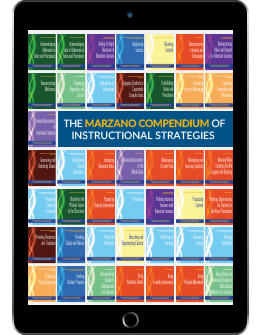 The Marzano Compendium of Instructional Strategies is an online resource for teachers, instructional coaches, teacher mentors, and administrators. Using The New Art and Science of Teaching framework, the Marzano Compendium presents 10 categories of instructional elements. Each of the 43 elements has a number of strategies associated with it. In total, there are 332 instructional strategies presented. Ten brief videos summarize the categories and provide an overview of the framework. Additionally, 43 videos of Dr. Marzano explaining each element provide more detail and allow educators to thoughtfully select growth goals. Each element includes a summary of the research supporting its effectiveness, detailed descriptions of the strategies associated with it, and downloadable print resources that offer classroom examples, reproducible pages, and scales that teachers can use to rate themselves on each element. The Marzano Compendium offers a convenient, easy-to-navigate resource that combines and updates content from Dr. Marzano’s most popular titles, including The New Art and Science of Teaching, Becoming a Reflective Teacher, and Coaching Classroom Instruction. This product provides a one-year subscription to the online Marzano Compendium. Your subscription begins the day you purchase the product. You will receive a follow-up email with access information. How do I access the Compendium? For credit card purchases, you will receive immediate access once your payment has been processed. In the future, to access the Compendium, log in to your account on marzanoresearch.com and access the Compendium directly from your account dashboard. You will see this dashboard as soon as you log in. Select “Books & Resources” from the menu bar, then “Marzano Compendium” from the drop-down. For check or purchase order, the order submitted online will not be confirmed until Marzano Research receives the check or a copy of the official signed purchase order. Your purchase order must note payment terms of net 30 days. We cannot process purchase orders that do not note these payment terms. Please submit all payments to orders@marzanoresearch.com. Once the payment has been received you will receive your access code, along with instructions on how to access the Compendium. After completing the initial setup, in the future, to access the Compendium, just log in to your account on marzanoresearch.com and access the Compendium directly from your account dashboard. You will see this dashboard as soon as you log in. Select “Books & Resources” from the menu bar, then “Marzano Compendium” from the drop-down. What if I need to request a refund? RETURN POLICY: Refund requests for digital products must be received within 10 days from the date of purchase. What are the technical requirements for equipment, software, and web access? You don't need any special software. High-speed Internet access is best for streaming videos. The courses are compatible with most browsers. This is the best site I have found to quickly locate strategies, see them in action and locate additional information all in one place. It is very organized and doesn't overwhelm you with lists of 100s of strategies in a row. The strategies are new and don't require a classroom management makeover to implement. To have everything at your fingertips is amazing. It has all you need to use research-based strategies. Just pick your need for that lesson and boom, a plethora of options. This is a great list of best practices. Like the layout. The compendium provides a vast amount of structured information for teachers and administrators. Within the guide are strategies to support the research and theory of each element. This document can be used for PLC's and for district wide professional development. Marzano has broken down the elements into digestible chunks for effective implementation. What an incredible resource. I'm am thrilled to use this compendium as a teacher myself, but also with the new teachers I work with. It is precise and very informative. We are just beginning to use the compendium with our leadership team sharing access for now. Our intro to the compendium was very good. We did note that we might need more strategies specific to the K-1 students, especially since many of them started school well below kindergarten-ready level. This is our first year of implementation of the Marzano Instructional Framework. The compendium came at the perfect time and will be helpful to use when engaging in professional learning with staff and to support PLC work. It would be even more powerful if there were a few videos of some strategies in action for each element, especially when it comes to addressing adherence to rules and procedures, or lack of...although engagement is achieved through well planned lessons, there are situations (seems to be more frequent and intense) when teachers are needing to deal with difficult behaviors. Thank you for the resources, I look forward to continuing use to improve teaching and learning!